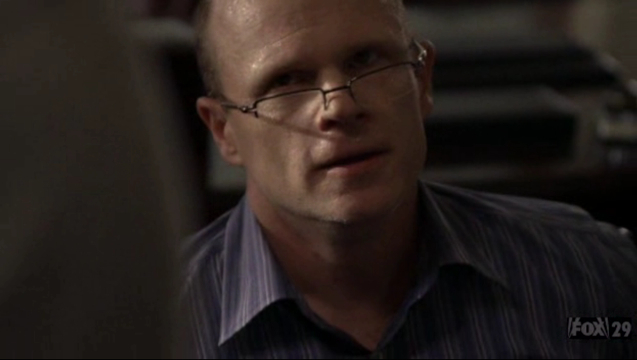 11:00 A.M. – Karen confronts Lennox about his progress on detention centers without the President’s authorization. She accuses him of setting dangerous precedent, but Lennox claims he is only taking defensive actions in light of the nuclear threat. 11:03 A.M. – Lennox turns to his Deputy Chief of Staff, Reed Pollock, to help get Karen off his back so he can focus on his proposals for the President. 11:05 A.M. – Nadia expresses her concern to Buchanan that the new internal security mandate requires all personnel with Middle Eastern backgrounds to succumb to new clearance restrictions. She will now be hindered from working on all sensitive files when they need her the most. 11:06 A.M. – At Graem’s mansion, Jack threatens to suffocate his brother to get the truth. Graem fakes crying that he doesn’t know where their father is. When Jack goes to use the plastic bag again, Graem admits that Phillip went to see one of his employees named Darren McCarthy. The Russian general gave their company BXJ smaller nuclear weapons to dismantle. Graem had hired McCarthy to handle it, but didn’t check him out. McCarthy stole the nukes and sold them to the terrorists. Graem and Phillip didn’t report it because they thought they could take care of the situation privately. Phillip put together a security team and staked out McCarthy in Simi Valley. Jack unties Graem and forces him to go there. 11:09 A.M. – As they leave the house, Graem orders his wife to stay in the house with Josh. Jack and Marilyn trade a look. 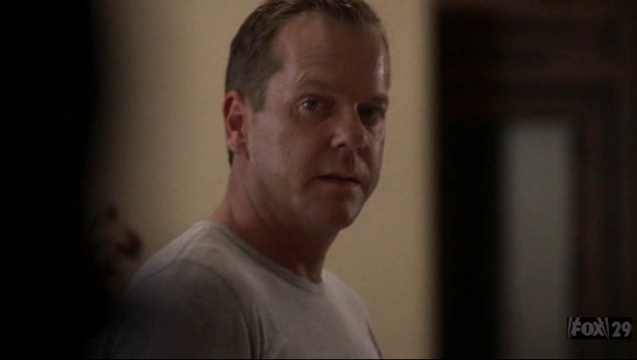 11:10 A.M. – Jack calls in McCarthy’s address to Chloe. 11:15 A.M. – Despite Morris and Milo sniping at each other, the CTU team determines that they can look for Fayed in the opposite direction of the nuclear fallout and through the technology he is using to track that fallout. 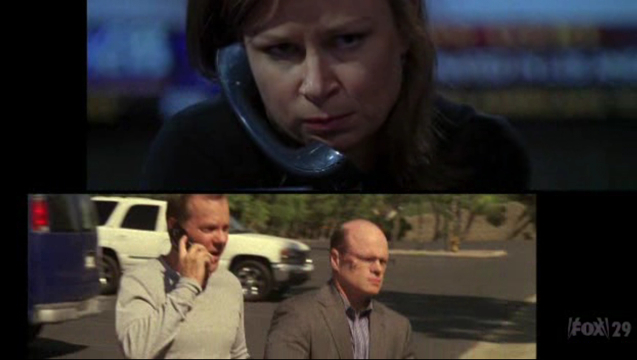 11:16 A.M. – As they drive to Simi, Graem accuses Jack of implicating the family. 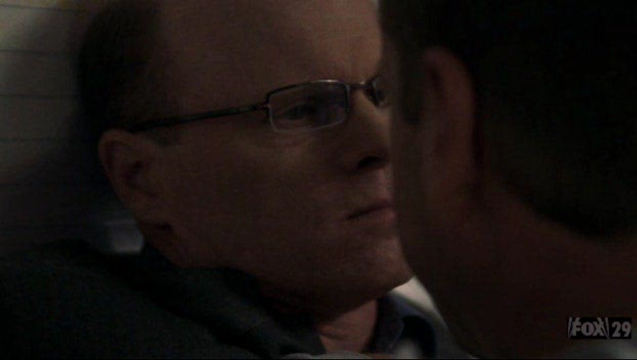 Jack assures him that CTU’s only interest is to stop further bombing. 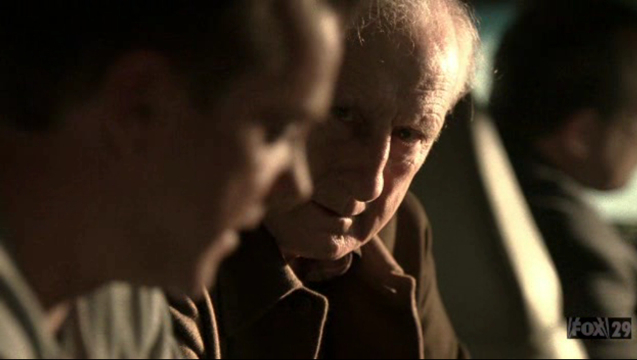 Jack briefs Buchanan on his family’s involvement through McCarthy. He still isn’t sure if BXJ has any other links. Graem notes Jack’s lack of loyalty to their family. “If I were you, I wouldn’t talk about loyalty,” Jack says pointedly. 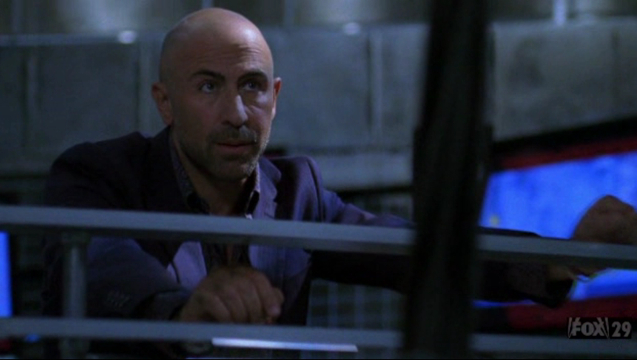 11:17 A.M. – McCarthy works the phone to find someone who can reprogram a nuclear trigger. His girlfriend Rita complains that she doesn’t feel safe and he gets annoyed. Rita softens with the thought of the seven million dollars he is expected to reap. Fayed calls McCarthy, and learns that the search is taking longer than expected. 11:18 A.M. – At Anacostia, Sandra watches as the FBI agent sends photos of the detainees in Walid’s circle to CTU. 11:19 A.M. – Morris is prevented from cross-checking the Anacostia inmates because he’s waiting on a manifest from Nadia. Milo asks Nadia why she hasn’t sent it out yet, and she claims that she is “backed up.” Nadia doesn’t want to tell him that her security clearance has been altered. 11:20 A.M. – Milo approaches Buchanan about Nadia falling behind in her workload. Buchanan covers for her until Milo objects. Buchanan confesses that Nadia was flagged because of her Muslim background. Milo is outraged. 11:21 A.M. – Buchanan calls Karen about the new racial profiling of agents affecting his team. Karen blames Lennox and wants to address the issue with the President. 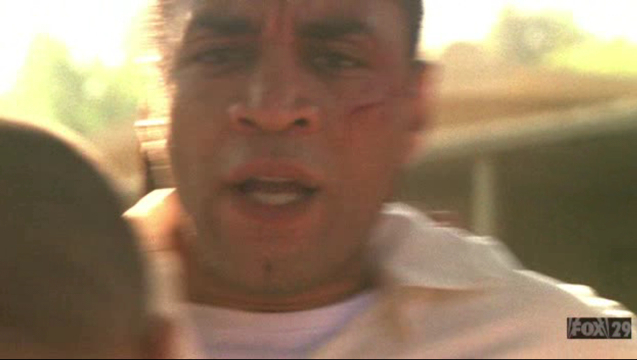 11:22 A.M. – In the prison, Walid asks Salim and the other men about the four nuclear weapons still at large. One of the men, Heydar, smuggled in a cell phone and has been in contact with the terrorists. Sandra listens in, and the FBI agent explains that he will need Walid to get the phone so they can place a trace. He wants Walid to stay inside to keep talking to the inmates. 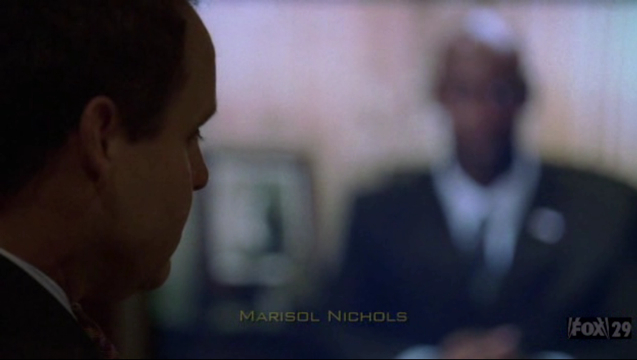 11:23 A.M. – Reed gives Lennox a paper with names on it. Lennox approaches Karen and asks her to tender her resignation because she covered up her husband’s incompetence. Over a year ago, Fayed was held in custody and Buchanan signed off on his release. Karen explains that Fayed was not a prisoner at the time. Lennox points out that the incident was covered up at Homeland Security, and he shows her the paper with all the people willing to testify against her. Karen is adamant that she did nothing illegal or improper, and she threatens to uncover his secrets in return blackmail. Yet Lennox has the proof in his hands and he again demands her resignation. 11:31 A.M. – When they arrive at McCarthy’s office building in Simi, Jack has Chloe check all the vehicles in the area to find out if any are registered to McCarthy. 11:32 A.M – Milo covers up for Nadia when Morris questions her slow work. Milo admits that Buchanan told him the truth. He illegally logs her in on his I.D. so that she can work properly. 11:33 A.M. – With the CTU agents outside standing by, Jack and Graem break into McCarthy’s office. 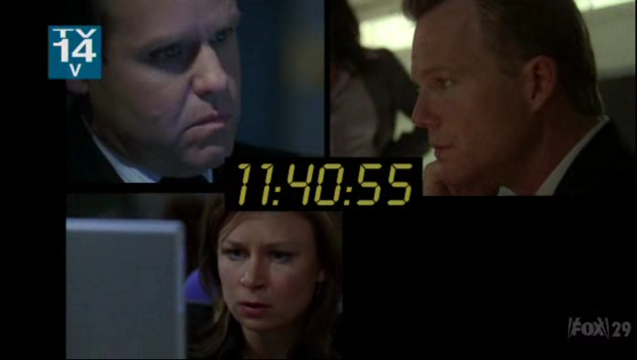 11:34 A.M. – Jack opens up McCarthy’s computer, but it is systematically shredding files. Jack hears a noise, and handcuffs Graem to go investigate. He finds his father Phillip with two security guards. 11:35 A.M. – Jack chides Phillip for not alerting the authorities to BXJ’s involvement when the bombs went off. Phillip says he was only trying to protect Graem from going to prison. 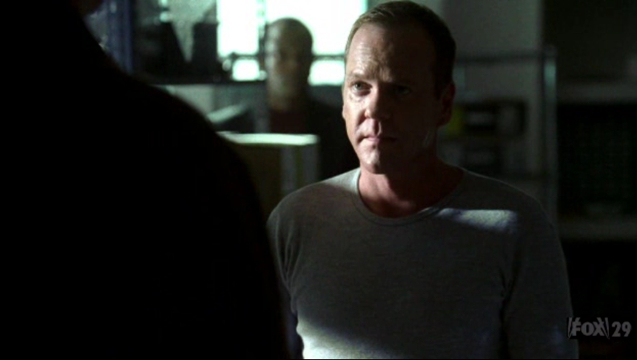 Jack goes to call CTU, and Phillip asks him to let them handle it themselves. Graem blames Jack for never putting family first, like he did when Teri was killed. This enrages Jack, and he goes to slug Graem. Phillip gives in and says they will do it Jack’s way and turn their information in. 11:36 A.M. – Graem refuses to accept Phillip’s decision. 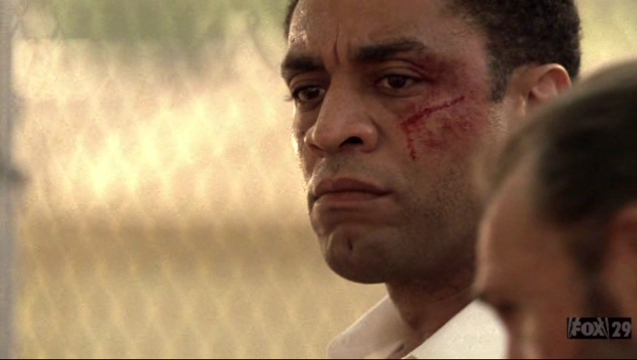 He gives a nod to the other guards, who grab both Jack and Phillip at gunpoint. Graem takes Jack’s cell phone to prevent him from calling CTU. 11:40 A.M. – At Anacostia, Walid notices Heydar read a message on the cell phone window. Walid walks in front of him and falls to the ground. When Heydar helps him up, Walid pick pockets the phone. 11:41 A.M. – The FBI agent gives Walid a number to dial so that CTU can trace the phone. Chloe logs the phone’s SIM card and the agent signals Walid to return the phone. Sandra implores for Walid’s release, but the agent needs to find out what else these men know about the bombs. 11:43 A.M. – Karen tells Wayne that she is quitting, and he asks if it has anything to do with her feud with Lennox. Karen will not give him the details. “You know what to do, Sir,” she emphasizes before asking to be reassigned to CTU in Los Angeles. Wayne approves military transport for her. 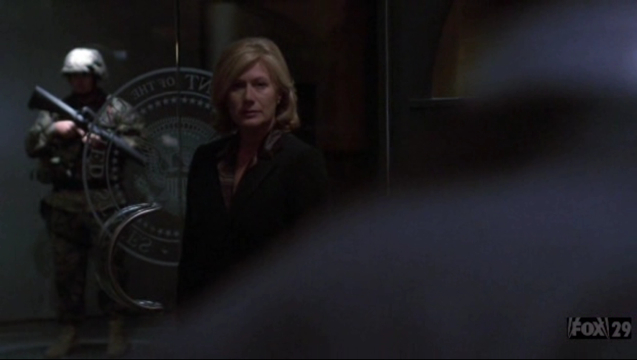 11:46 A.M. – As Karen leaves the President’s office, she bumps into Reed and he asks her to hand something to the President. She tells him to give it to Lennox instead. Reed quickly calls Lennox with the news that Karen is out. 11:55 A.M. – McCarthy and Rita check into a motel so that he cannot be located. 11:56 A.M. – Chloe looks up the log from Heydar’s phone and finds that none of the numbers are connected to Fayed. The phone’s browser has logged onto a terrorist website that had all the information. The inmates are not actively involved with the bombings. Sandra orders the FBI agent to get Walid out. In the yard, Heydar realizes his phone is gone and he points to Walid. The other men grab Walid and find the cell phone. Heydar and the crowd of men start attacking Walid. 11:57 A.M. – Sandra runs into the yard with a guard who pulls them off. Sandra tends to Walid, crying. 11:58 A.M. – Graem’s men lead Jack and Phillip out of the office building in handcuffs. Outside, the CTU agents are dead. 11:59 A.M. – As Graem goes in another car, Jack and Phillip are loaded into a van.